The Inaugural Annual General Meeting of the College was held 13th June 2015 at the Meeting Room, 3rd Floor, Academies of Medicine Building, Jalan Tun Razak, Kuala Lumpur. 17 members in benefits attended the meeting. The Annual General Meeting elected eight council members. For the formation of the College, the College received a sum of RM20,000.00 from the College of Surgeons as goodwill which had already been duly deposited into the College account. The College’s latest membership database as of May 2015 showed a total of 133 under the College of whom 35 are Life Members. The College webpage is now functional and accessible; members can access the page via the Academy’s webpage. A link is available also on the College’s official Newsletter "my.eye"
The design for the College’s logo was adopted during the 5th council meeting held on 28th March 2015. The logo will now appear on all official documents of the College together with that of the Academy. The Council proposed that it will seek the views of members on the formation of chapters and special interest groups at the coming annual general meeting. During a symposium organised by the Ministry of Health on 6th April 2015 named “Survival Kit in Neuro-Ophthalmology” in which Dr James Barry Cullen was a speaker, Dr Cullen was presented with the “Outstanding Clinical Leadership Award in Ophthalmology” by the College of Ophthalmologists, Academy of Medicine of Malaysia. The College co-organised with the Ministry of Health a refresher course in Medical Retina and Uveitis on 19th August 2015. 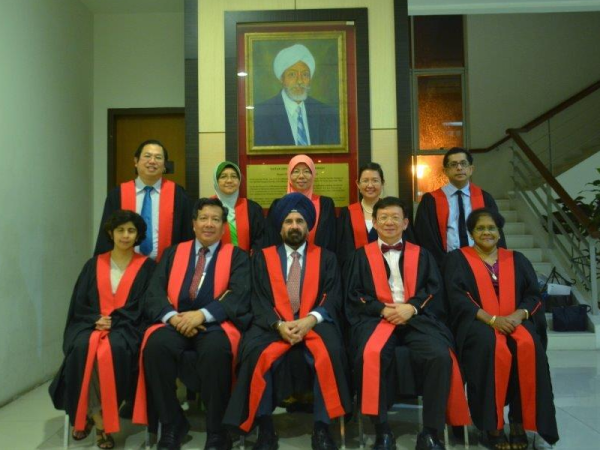 Academy of Medicine of Malaysia.